Tachometer is a RPM counter which counts the no. of rotation per minute. There are two types of tachometer one mechanical and other one is digital. Here we are going to design an Arduino based digital tachometer using IR sensor module to detect object for count rotation of any rotating body. As IR transmits IR rays which reflect back to IR receiver and then IR Module generates an output or pulse which is detected by the arduino controller when we press start button. It counts continuously for 5 seconds. After 5 seconds arduino calculate RPM for a minute using given formula. RPM= Count x 12 for single object rotating body. object = number of blade in fan. As shown in the above tachometer circuit, it contains Arduino Pro Mini, IR sensor module, buzzer and LCD. 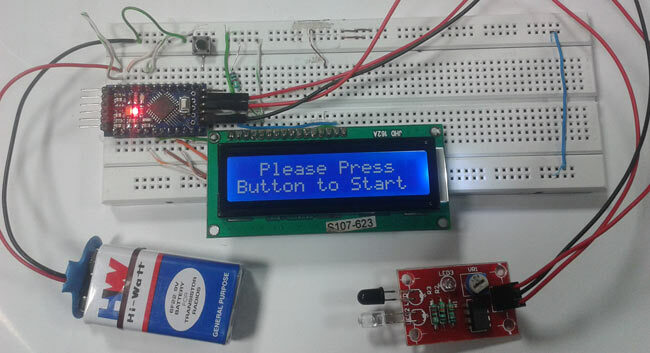 Arduino controls the whole the process like reading pulse that IR sensor module generate according to object detection, calculating RPM and sending RPM value to LCD. IR sensor is used for sensing object. We can set sensitivity of this sensor module by inbuilt potentiometer situated on IR module. IR sensor module consist an IR transmitter and a photo diode which detects or receives infrared rays. IR transmitter transmits infrared rays, when these rays fall on any surface, they reflect back and sensed by photo diode (You can understand more about it in this Line Folloewr Robot). The output of photo diode is connected to a comparator, which compare photo diode output with reference voltage and result is given as output to arduino. IR sensor module output pin is directly connected to pin 18 (A4). Vcc and GND are connected to Vcc and GND of arduino. A 16x2 LCD is connected with arduino in 4-bit mode. Control pin RS, RW and En are directly connected to arduino pin 2, GND and 3. And data pin D4-D7 is connected to pins 4, 5, 6 and 7 of arduino. A push button is also added in this project. When we need to count RPM we press this button to start this Arduino Tachometer to count RPM for five seconds. This push button is connected to pin 10 of arduino with respect to ground. In code we have used digital read function to read output of IR sensor module and then calculate RPM. What if I flipped the direction switch on the fan to make it spin backwards? How could you sense direction as well as RPM? You would need to IR modules connected to the Arduino, and code that would detect which one is "tripped" first. Great project! I'm curious as to what the double count loop is doing, and what the 1227 count has to do with. I suspect it's related to the processor speed of the board... but how? If you read the instructions, you will see that the code runs for 5 seconds. Multiply the revolutions found after 5 seconds by 12 to get revolutions per minute. Pin 13 connects to the onboard LED on the Arduino, and so the code will flash that. Could you please explain the nested loop? I meant nested >FOR< statement. I know what it's doing, just don't know the significance of sampling the RI sensor 1227 times, each for a total of 1000 times. John. what is the maximum rpm that you can measure with this setup? I am trying to use this example to make a tach for my home built cnc router. I am having trouble getting accurate counts. I am aiming the ir module at the chromed surface of a cylinder (fan shroud)on the spindle. I have tried using a strip of painters tape as the indicator. Should I cover most of the cylinder with the tape and read a small area of the chrome? vice Versa? Use flat black paint? Does the same code work for ardunio UNO?